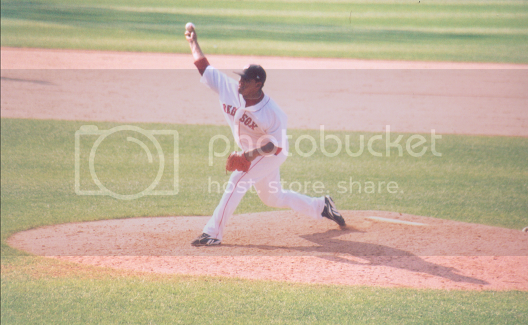 PawSox Heavy: Something new about Devern Hansack. "Hansack is too old to have any real hope of further improvement, but those minor league lines translate to at least brief utility in the majors. He still has at least one “option” remaining [he has two], so the Red Sox can shuttle him back and forth between Pawtucket and the majors as often as is necessary in 2008. This flexibility is a mixed blessing for Hansack. It almost guarantees that he will not break camp with the club, beginning the season at AAA, yet it also makes him a prime candidate to be the “first into the breach” if there is an injury in the rotation requiring a DL move. He will get his chances this year, especially if he impresses in Spring Training." "Devern Hansack is not the Galan af his comunity, but since he went to play baseball outside his country all the Girls in his comunity want a peace of him, he can get any girl he want in his comunety but only one I sure he would not get, I was investigetin about and her name is Celeste campbell, she is family Lumberto Campbell who she dont cary well with, but she is the most down to earth young woman and will not play in with the game Dever like to play , SCORE and walk all the ahter boys beth that he will not give streike to this bater(Celeste). What make this girl so special ? she is pretty ? smart? Not so pretty, Not so smart a little of the 2, but she is caractarize as beoutifull person from the inside, a critian but a little liberal about cristian and religion well thats all I could say about this woman for this moment I will investigate more ." Hansack's been sent back to Pawtucket along with Jonathan Van Every. I am going to have to make a Hansack t-shirt out of old socks or something. Maybe a Nicaraguan flag. I'm hoping he either gets a quick call-up or gets a shot on another team.